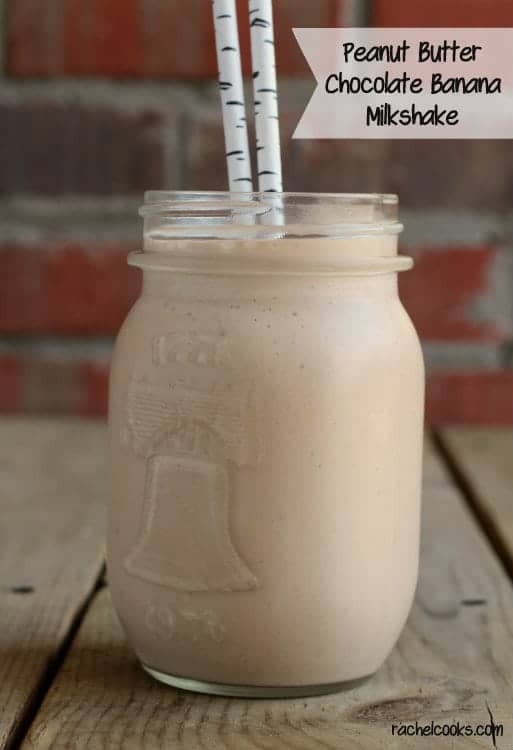 This Peanut Butter Chocolate Banana Milkshake is cool, refreshing and perfect for a hot summer day. And what better flavor combination is there? Can you believe that it is already the last day of Frozen Treat Week? I’ve had so much fun with this theme and want to say a big thank you to Nutmeg Nanny and Katie’s Cucina for hosting. This milkshake is a quick and easy treat with classic flavors, this milkshake will win anyone over. I kept it pretty simple but it would be great dressed up with some whipped cream and a cherry on top. I love the flavors of chocolate, peanut butter and banana together, but if you’re missing one of the ingredients, it would also be great with only two. Peanut butter and chocolate? Always a match made in heaven. Don’t have bananas? 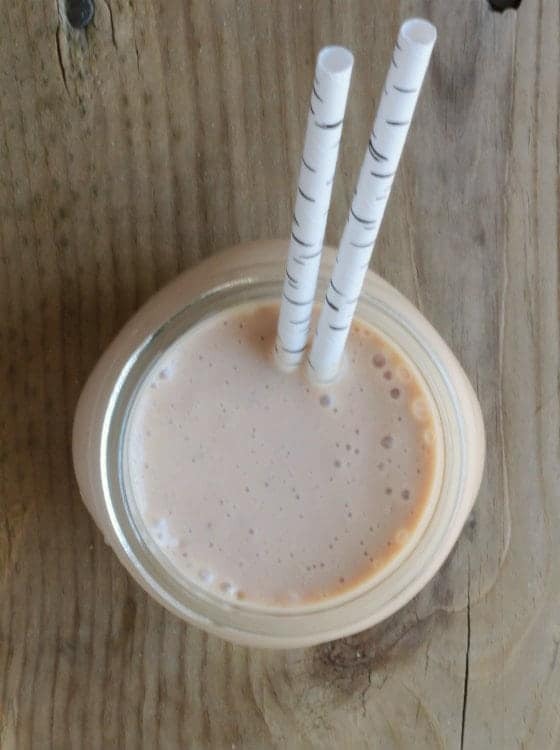 A PB and chocolate milkshake sounds pretty great to me! Don’t like chocolate? I guess if that’s truly the case, after you go seek help for that horrible affliction, you can make this minus the chocolate if you’re still not cured. My husband added vanilla protein powder and drank this after a workout. And because it has a banana in it, you can feel totally good about eating it — gotta get your fruit, right? If someone you got this far into this post and chocolate isn’t your thing, you might love this seriously fun sprinkle ice cream pie – the crust is the best part! Or if you’re looking for something healthier, you can’t go wrong with this two ingredient strawberry sorbet with mint. 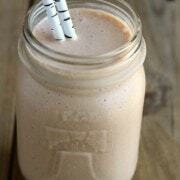 This Peanut Butter Chocolate Banana Milkshake is cool, refreshing and perfect for a summer day. You’ll love the combo of these three classic ingredients. Verdict: Sweet and delicious with the perfect balance of chocolate, peanut butter and banana. Husband’s take: He would have preferred it the peanut butter chocolate banana milkshake minus the peanut butter but I didn’t listen. He still drank this, twice! Sounds lovely but where is the chocolate in the recipe?!?! It’s in the form of hot fudge :) One of the best forms of chocolate, in my opinion! Trying to gain weight while going through Chemo. 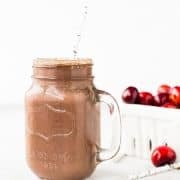 Hard to find a smoothie that will stay down and taste absolutely wonderful and I have found it with your recipe! Thank you! This comment warmed my heart. I’m so glad I could help, even in the smallest way. Thank you for letting me know. Sending prayers (and milkshakes) for health! This is the best shake I’ve had in a long time! Wow, thank you! So glad you enjoyed it! I absolutely love this recipe. I was pleasantly surprised how the texture of this smoothie was truly like a milkshake. I would love the Blend -Tec to make a cabbage and spinach ice cream!! The first thing I would make with The Blendtec would be a squash soup and then a cherry malt. I would love to know more about that jar- absolutely love it! That’s awesome- thank you so much! I normally make this combo as a smoothie but with ice cream sound so much better! A smoothie sounds delish too! This has been my favorite milkshake combo ever since I was little. Sometimes I just freeze the banana and skip the ice cream! Kudos on the healthy choice ;) I always recommend ice cream though, haha! I have to know where you found those straws. I need them in my life. Aren’t they fabulous? Here is where I found them on Amazon: http://www.amazon.com/gp/product/B009314ZSK/ref=as_li_ss_tl?ie=UTF8&camp=1789&creative=390957&creativeASIN=B009314ZSK&linkCode=as2&tag=notracray-20 (that’s a affiliate link, fyi). So…If I made your milkshake with my pb cup ice cream…I’d pretty much be set for life. As in, I’d never eat anything else ever again. Omg — best idea ever! I love a good margarita! Wooooooooo! I am totally making this for my dad the next time we get together. He’s a peanut butter maniac. I want one, too, honestly! Thanks Rebecca! Hope he loves it! This has all the flavours I want in a milkshake! LOVE this! 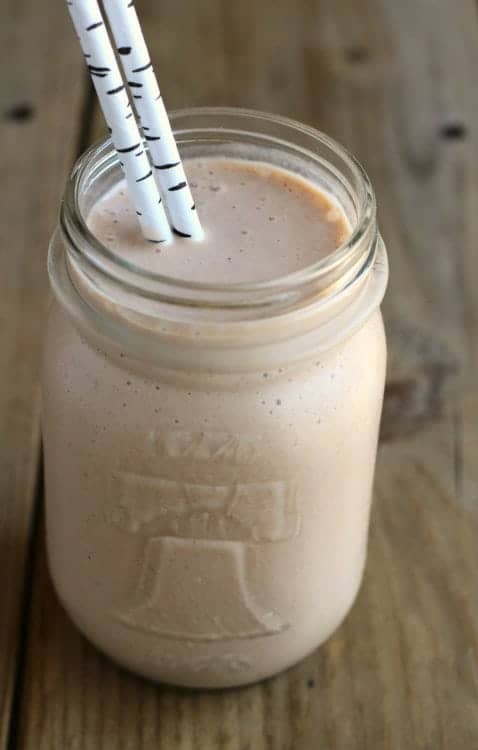 Nothing better than a pb and chocolate milkshake. The addition of the banana makes it that much better! Thanks Samantha! Had fun seeing your frozen treats! Awwww…I’m going to miss frozen treat week!! Your milkshake is the EXACT type of treat I crave on a daily basis. It looks delicious! And your jar is super cool!! Love the milkshakes anything with pb is always good! Thanks Erin! I agree about PB! Chocolate & pb is absolutely one of my favorite combos…add banana into the mix and it doesn’t get any better! That blendtec would do wonderful things to my fav cake batter milkshake! 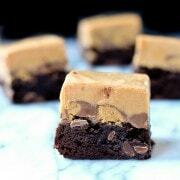 These look too good NOT to make, and NOT to dream about, wow! Thanks for putting this up, I see them being enjoyed by our family in the very near future! Ok, #1: I love those straws! #2: Best shake combo ever!! 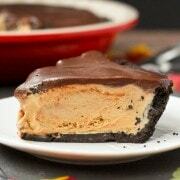 #3: So thick and creamy that I need this right now! Thanks! I got the straws on Amazon :) Search birch paper straws. Oh my. I can’t even tell you how much of a sucker I am for chocolate peanut butter…add in the banana and I’m your best friend! This looks amazingly cream, Rachel! Thanks Caroline! All your creations looking amazing too! Yum! This looks so good and so easy! Thank you so much for participating this week! It’s been a blast sharing a wide variety of frozen treats with all of our blogging friends around the web! Thanks so much for hosting, Katie! You and Brandy did such a great job. I noticed that — so funny! I think it is a GREAT idea for breakfast!